This morning I read a post about an adult who was suffering with depression and struggling to keep his diabetes in check. He knew what to do but just could not always bring himself to do it. The post really struck a chord with me. As a parent of a teen with diabetes, I don't have to remember to test before and after every meal or intensive activity. I don't have to remember to bolus for every meal. I don't have to watch my pump for reminders of site changes, low cartridges and low insulin. I do not have to carry around constant reminders of my diabetes. My son leaves the house and takes diabetes with him. When he sleeps elsewhere, he is in charge of his own care. I technically get a break. I still think about it. I still count the carbs in a meal out of habit. I will still keep an eye on dates and ask about site changes. I will look at trends and deal with adjustments. I get tired and yet I am not the one living with diabetes 24/7. This scares me. My son came home a few days ago after spending time with his father and other family members. He didn't change his site. I avoided looking at his meter until later that evening. He had come home alive. I did not want to ruin our reunion if things were not as they should be...and they weren't. When I finally scrolled through the meter that he used, I found times that he went over 12 hours without testing! The readings that were all "in range for the most part", included a 28 (504). I was too tired to scream despite having just had five days away from diabetes. I was too tired to fight about it. I read through the readings aloud. I asked him if he had used another meter because there were a LOT of missing readings. He gave me his usual look of "of course I must have used another meter because I would never do something like totally neglect myself just because you were not there to remind me." I knew otherwise. He knew I knew. I walked out of his room. If I can get this tired, this frustrated, this worn out after 11+ years and its not my disease, how do those living with it handle it? How can we not expect depression? How can we not expect burnout? We can't. We can only offer help and be there to lean on. My son has been able to bolus on his own for many years but there are still times when he hands me his pump after a meal. He has been doing his own site changes since he was at least 11 or 12 but he still calls me in now and then to do them. I am okay with those breaks. He knows what to do but some days its just nice to let someone else deal with it. I hope I can continue to do this for him...not forever but whenever we are together. Hopefully it will help when he has to battle his own diabetes demons. Your post really hit me hard. I think it's really special that you care so much for him, but at the same time, I've been in his place where I want to control myself. I've had some times where I think I needed to learn the lesson on my own, instead of being told by someone else. I don't have any answers for you, but I want you to know that he will learn. You should know that you are doing the right things and he will thank you one day. I saw Your post from TuDiabetes and was amazed with what you had to say. 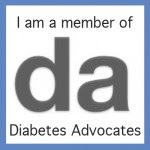 I've been a diabetic for 31 years since the age of 6. Reading your post I wonder if my mother felt the same way as you do. I two would go with my dad and not test, but I still took my insulin... If it helps any I'm still alive and kicking with no diabetic related problems. I wish your and your son the best of wishes and thanks for writing this post. This is the first Christmas Day since we got a bg meter 11 years ago that we had lovely bg levels. I think my husband was coming down with the cold he now has and his lack of ADTH was interfering with his cortisone production. Or, maybe, we are getting better at managing. Keep on truckin'. "As the guy who jumped off the top floor of the Empire State Bldg said on his way past the first floor, "So far, so good.""